Being married to a chef there are lots of things in our cupboard, some more useful than others, such as the dedicated nutmeg grater (mine) and the wine aerator (his) and mushroom brush (his). He also has a fetish for all kinds of mustard and salt – porcini salt, smoked salt, chilli salt, lemon salt, red wine salt, pink Himalayan salt, black volcanic salt, pyramid shaped salt crystals, rock salt, and regular flaked sea salt. One thing that is always in the cupboard and is used with abandon is honey. We’ve been keeping honey bees for about 6 years now and they are amazing little insects. Bees and other pollinators are so important to global food production and they need our protection.Did you know that bees are responsible for the pollination of all the fruit, vegetables and nuts that grow above ground, about 1/3 of everything we eat, contributing £651 million to the UK economy per year. Bees must visit 2 million flowers, travelling for 55000 miles to make a pound of honey. A worker honey bee will make 1/12 of a teaspoon in its lifetime. 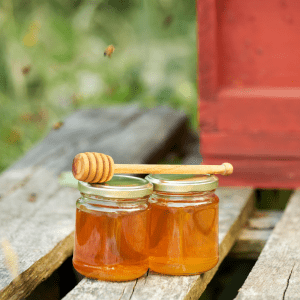 Natural honey is the only food which contains all the minerals necessary for life and because it has anti-bacterial and anti-fungal properties, it will keep almost indefinitely. In fact, there’s been 3000 year old edible honey found in Egyptian tombs! 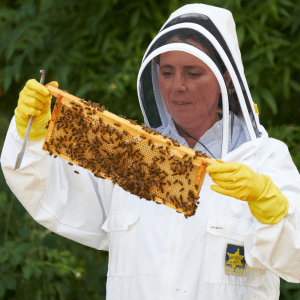 If you web search “health benefits of honey” about 1.6 million results come up, but primarily we use it for its fantastic flavour and sweetness. We use honey for so many things in the kitchen. 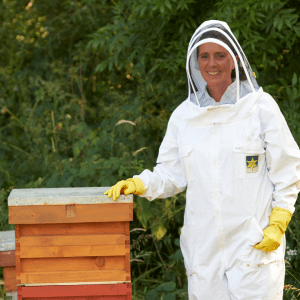 Here are some favourites…..
Buy local, raw honey if you can and use this in your cold dishes where the complexity of flavours is more pronounced. If you’re going to heat it, or cook with it, you don’t need to be as particular about the type of honey you buy.